I’ve never been much of a fan of using masking fluid in watercolour. I tried it many years ago (it was thick and greyish), probably ruined a few brushes in the process and threw out the bottle. It always seems so obvious that an area in a painting has been masked and besides, I’d rather just paint around the whites. Despite my hesitation about using the stuff, I bought some recently to use on a freelance illustration job that I’m working on. I have to save a light area in a large, gradated wash and I’m pretty sure it will be quite impossible to paint around it. 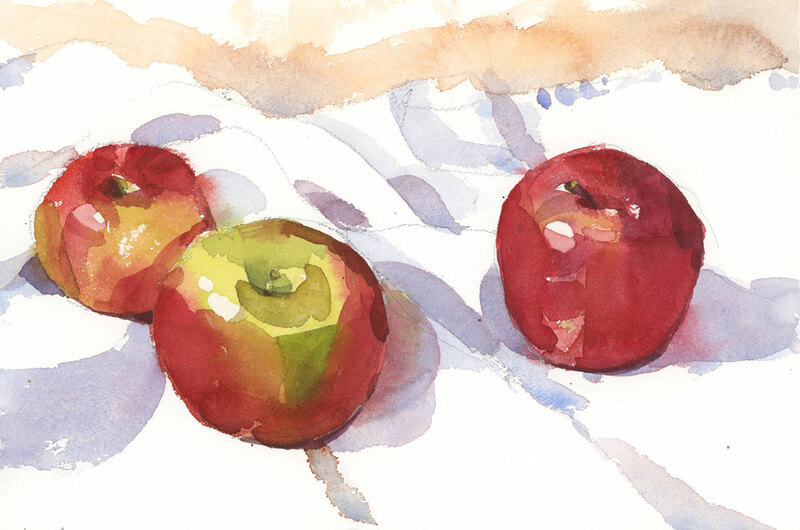 I tested out the masking fluid (Daniel Smith brand) on this apple sketch (in the apple highlights) just to see if the stuff is any better than I remember it. Fortunately it is. It’s a lot easier to apply, much thinner, transparent and very easy to remove with a rubber cement pick up. And now that I’m older and wiser, I also remembered to wash the frisket out of the brush before I ruined it. This is very useful Carolyn. And I like the Goof off tip as well. I need that for a few other things around the house so I will have to get some. Thanks! It has taken me years to wrap my brush and head around masking. It’s still a challenge – particularly with subjects like ocean surf. But it does provide a drama that straight painting can’t quite achieve. Good for lace, fringes etc. as well. stroke brush over bar soap (pure) and then swish again in water, dry slightly on paper towel and then dip into frisket and apply. Best to do this each time as it protects the brushes. Thanks. These are good tips. Of course I wasn’t using a sable brush, it was some old, cheap brush I had in my studio but the soap tip is a good one. Did you have to soften the edges later? or did you just leave them ? – my bottle of frisket is still full and looking at me, I guess I’ll give it a go! In this case I did soften the edges a bit, or rather I went in with some paler washes on top of the white areas (in some spots). Give yours a go and let me know what you think. My almost unused bottle of frisket came out in a great big solid ‘gloop’ the other day …I wash my frisket brushes in hand-wash liquid for delicates! Another good idea for washing the brushes. I have some of that. Thanks! Now I have memories of using the Windsor and Newton masking fluid back in my watercolor days! I like your apples. I have never been able to get much from masking fluids. Thanks Lee. This is not my favourite solution either Lee and I don’t use it for personal work but this is for a very specific need so I had to try it. Like you, I tend to stay away from using frisket. Usually I can somehow manage to keep spaces blank even if I’m applying a wash. Where its more difficult is where a large area has to have plenty of small blank dots – like a night sky with stars, or a summer field with daisies. In these sorts of situations I reach for my smelly bottle of frisket which is usually dried up. Frisket is an expensive tool but regrettably one that you can’t just do without. I have a love/hate thing going on with the Winsor Newton bottle of masking fluid. I get good success applying it in thin lines using a Speedball pen nib. I constantly dip the pen in water first, then the masking fluid, and clean the nib frequently. The watered-down fluid seems to mask just as well and is a little less obnoxious to use.